Ami amar class friend er basay berate gelam rate ghumer ghore dekhlam amake eshe kiss korte che amake joria joria kiss korlo ami sojjo korte na pere mosa mera abar ghumia roilam. . . Apni ki vebesilen? Se Aslo,Amar Upor Boslo,Amake Joria Dorlo,Pore Kamor,Kiss Dilo,Ebar Nijer Proyojon Mitaiya Palaiya Gelo,Don't Mind.eti Acti "Mosa". Ekhon amr hate 1 botol bis.Ami mukti pete chai.Eto jala amr r sojjho hoyna.Jani eta pap.Eto jontrona r valo lagena.Tai jacchi"EDUR"marte! Rog hole Doctor er kache jao, karon Doctor-ke kheye banchte hobe. Oshudh keno, karon dokandar keo bachte habe...Kintu oshudh KHEYONA, karon TOMAKEO BACHTE HOBE ! 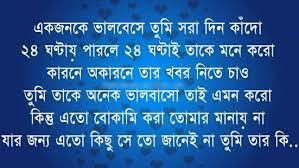 Fuler majhe vomor ase, Nodir upor nowka vase, shishir nache sobuj ghase. Rater maje josona hase.. R kichu meyeder valobashar maje FORMALIN ache. Jekhane Valolaga, sekhane Valobasha. Jekhane Valobasha, sekhane prem. Jekhane prem, sekhane betha. R Jekhane betha, sekhane. "Tiger Bum". Odvut kichu aabeg.. Ojana kichu onuvuti.. Oshomvob kichu valo laga.. Hoytoba koster voy.. Akakitter nirobota.. Ai niye amader TOILET-E boshe thaka..
Chay na ami "Shakib khan" Er priya Chay na ami Hiroin "Oyshowriya" Chay ami 2mr moto "Expart" kajer buya Ki hobena? Sunil akas, Nirmol batash. Uttal torongo, Mukto bihongo. Base basi, Chader hasi. Sagol koto sundor. Sms porci ami ak bandor. ....ha...ha...ha..
2mi jodi bolo Saper gorte dite pari hat, Sundorboner Bager Sathe katate pari rat. Pari ami kun kune site Nodite namte, Sorry,R Parci na ami Mittha katha bolte..! Taal gache Supari dhore.Supari gache Taal.Preamik Preamikar Rup dekhile Bang e faal. Ai gorome 2make 1ta THAPPOR dilam.ki mind korle? THAPPOR means: T=Thanda, H=Haowa A=And P=Porjapto P=Poriman O=Ovinondon R=Ridoy tekhe. Moyna thake dale dale.Beng thake khale.Tumi amay bhalobashle.Sharom lage gale.Tyto ami chupmu khabo tomar misty duti gale. Do u want 2 touch my heart?Pls enter password***** wait.... >>Processing>> Password Error! Sorry,u have touched my leg. "Beche tako BABA"
(Ha/Na) diye nicher gaps puron koro-(5ti).1---- ami manush na.2---ami fazil,3----amr moto pagol r nai.4----ami bekub.5----ami gadha. Sigarate R Meyeder moddhe onek mil.jemon sigarate cheleder thot pure kalo kore dey.R meyera cheleder valobasar chalonay fale ontor pure chaye kore dey. Ami Tumay Valobashi" Tumi Amay ValoBaso Na, Ami Tumar Kace Asi" Tumi Amar Kace Aso Na, Ami Tumay Onek Lati Mari ____________But__________ Tumi Amay Maro Na! Borsar agomone bristy jorche apon mone.Vijce poth,vijce ghat,Aro vijce fosoler math.Jokhn jaw 2mi paye hete,Ish Tokhon Jodi 2mi 1ta Achar Khete..! Jodi Ghumiye Thako,Tahole Sopno Dekho.Jodi Mon Kharap Thake,Tahole Rifat.Rasel- Er sMs Poro.R Jodi Akdom Free Thako,Tahole 10Bar Kane Dhore Uth Bosh Koro..! Onek Meye "Mula" Diye Kore,Abar Onek Meye "Gajor" Diye O Kore,Abar Onek Meye "Sosha" Diye O Kore.Abar Sob Kico Ek Sathe Diye O Kore....KI Kore Jano...? "Aree Salad Toyri Kore R Ki"
Ai SMS Porle 2mi 'GADHA' R Na Porle 'BOLOD'.SMS Kawke Dhekale 'GORU' R Na Dhekale 'CHAGOL' SMS Pore Mind Korle 'VERA' R Na Korle 'DUMBA'. SMS Delete Korle 'BANDOR' B Na Korle 'HANUMAN. SMS Back Korle 'PAGOL' R Na Korle 'RAMCHAGOL' So Choice 2mar. Nari Hotat Kore Kade,Hotat Kore Hase,Hotat Kore Purus Manus Tader Jale Fase.Faisa Giyaa Hukur Hukur Kase. U r BANDAR.... it means, .. B= Beautifull A= Attractive N= Naughty D= Decent A= Adorable R= Romantic , R u Smiling?..! !